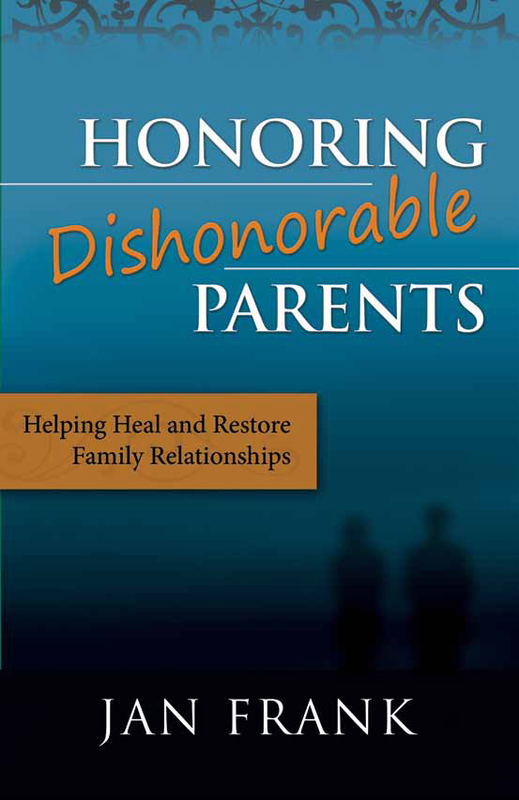 • How do I honor my parents when they’ve acted so dishonorably toward me? • Does God expect me to pretend that the things that went on in our home never happened? • Does honoring them involve subjecting my children to some of the very hurtful and sinful actions I experienced as a child? In Honoring Dishonorable Parents you’ll find the answers to these questions and more as Jan Frank candidly shares her own journey of honoring parents who acted in “less than honorable” ways throughout her life. She draws from her twenty year experience as a family therapist and demystifies what honor does and doesn’t mean based upon sound biblical teaching. This book debunks idealistic notions of what honoring our parents means and offers a fresh perspective of harmonizing honor with appropriate boundaries. It illustrates and instructs men and women of all ages who want to know how to maintain respectful, caring behavior toward their parents without being entangled by guilt-producing manipulation, feelings of over-responsibility, continuous family drama, or repeated verbal conflict with parents. Honoring Dishonorable Parents is for all those who desire to know what it looks like to honor parents with grace and truth. Order your paperback or kindle version from Amazon! A powerful story of inspiration and restoration, Door of Hope is Jan's journey toward wholeness from sexual abuse. It offers ten proven steps toward recovery and a special section featuring answers to questions most often asked by abuse victims and those who love them. When there's nothing more that you can do, God's deepest work has just begun. Waiting...it's one of those things that no one likes to do. It's also one of those things that God seems most fond of using to shape and mold our characters to be like Jesus Christ. What should we do when we find ourselves in God's waiting room? A Graceful Waiting presents some of the pitfalls as well as the precious promises we encounter as we learn to trust God's timing. Through fresh insights from her journal and touching illustrations, Jan Frank reassures us that waiting is indeed one of God's choicest methods of bringing us into a deeper intimacy with Himself. "Breaking the Cycle of Abuse"
Discusses the cycle of abuse, replication of sinful patterns, and effective treatment for survivors.